Pogacha also spelled pogača, is a white bread that Serbians, Croatians, Macedonians and other Balkans, Turks, and Hungarians all claim as their own. 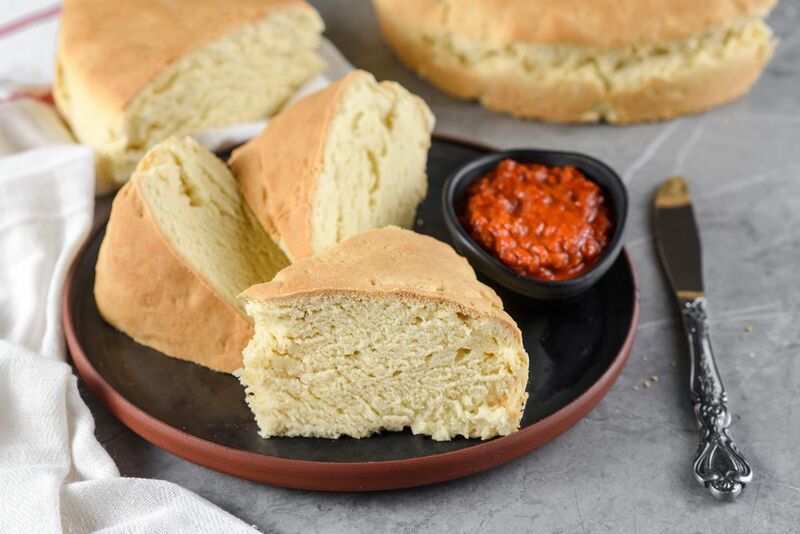 It is similar to Italian Vienna bread in texture and flavor—soft crust, fine crumb—and there are as many recipes for it as there are shapes, although round is traditional. This one-rise recipe produces a round loaf. Compare it with fasting pogacha bread (Posna Pogača), a recipe that contains no eggs, milk or butter. Christian Orthodox Great Lent is a time of great fasting so that lean Lenten white bread fits well within the guidelines. Pogača (Balkan spelling), Pogacha (Anglicized spelling), Pogácsa (Hungarian spelling), poğaça (Greek), pogaçe (Albanian) are all rustic leavened or unleavened breads made with white flour or whole-wheat flour or a mixture a combination of the two. Some breads have a potato or cheese filling and herbs like dill and sesame mixed in with the flour. Scald milk and add butter. Allow to cool to lukewarm. Add yeast and sugar and stir until dissolved. Measure 5 cups flour into working bowl of a stand mixer fitted with the paddle attachment. Add milk-yeast mixture, sour cream, oil, egg, and salt. Mix well. Switch to the dough hook and knead on medium-low for about 5 minutes or until dough is smooth and elastic. Turn out into a large greased bowl. Flip dough over to grease both sides, cover and let rise until doubled. See this quick tip for faster rising. Heat oven to 350 F. Punch down dough and place in a 10-inch round greased pan with high sides (about 3 inches) or handshape into a 10-inch round and place on a parchment-lined baking sheet. Using a sharp knife or a lame, slash top of dough three times. Some make an "X" on top. Bake about 1 hour or until the instant-read thermometer registers 190 F.
Serve with butter or ajvar (a roasted pepper-eggplant spread) and kajmak (a homemade unaged cheese spread). As you can imagine, every country (and every cook for that matter) makes pogacha its own way, so they can be found in different textures, flavors, sizes, and heights. Some have a crumbly scone-like texture while others are more like tender white bread. In Bulgaria, where the bread is known as pogačice, it is more of a puff pastry affair and often served hot as an appetizer filled with sour cream or curd cheese or Bulgarian feta cheese. This is also popular in Turkey. In Hungary, for example, pogácsa are made from either short dough or yeast dough. There are dozens of shapes and sizes; round is the most traditional. A multitude of add-ins can be found either in the dough or on it—fresh cheese, aged cheese, pork crackling, sautéed cabbage, pepper, paprika, garlic, red onion, caraway, sesame, sunflower or poppy seeds.